This unique combination of tumbled blue kyanite and black tourmaline is all the deep, dark mystery you would expect, with a flashy blue sheen. Mesmerizing. Your tool for tranquility, alignment, grounding, and protection. Those of you seeking peaceful freedom from the negative vibrations that might assault you during meditation, this one is ideal to hold onto. 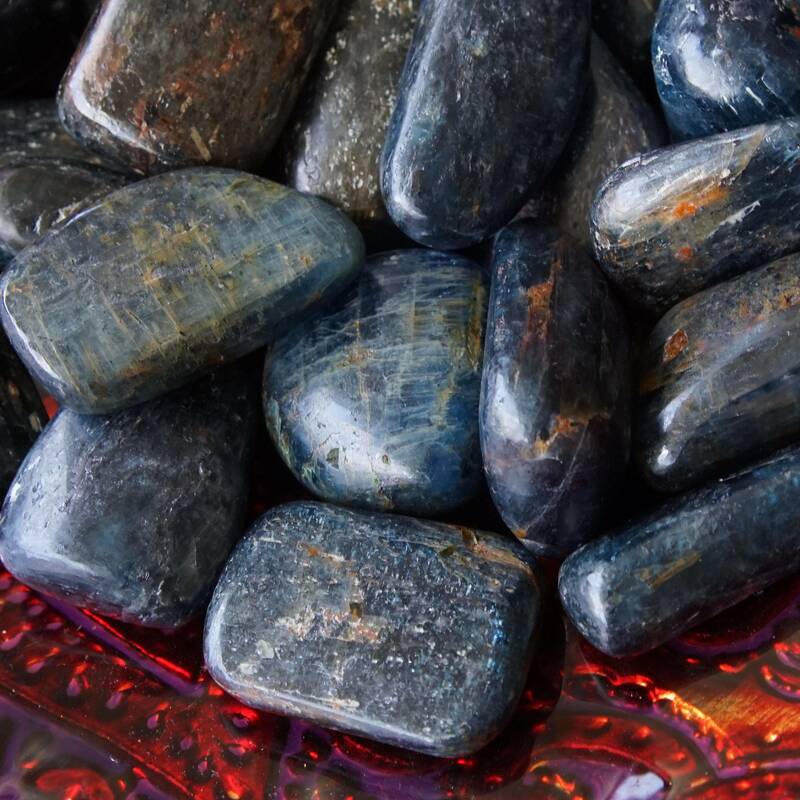 While the crystal energy of kyanite brings instant chakra alignment (the only stone to do so), black tourmaline shields your personal energy from intrusion. In addition to aligning the chakras, blue kyanite is a calming stone that draws you inward toward your core, strengthening your will and vision, so you move in concert with the highest good for you and your kind. And black tourmaline acts as protective armor around people and places, preventing theft and crime, grounding you, and creating safe space. Aside from holding this stone in meditation, it is also an ideal specimen to have wire-wrapped as gemstone jewelry. Wearing it means the stone will be near you and in direct contact with your skin effortlessly. This close proximity will hold your chakras in alignment and keep you surrounded in a protective barrier as long as you wear it. I’m offering this stone in two sizes: medium (about .75-1” in size) and large (about 1.25-2″ in size). Please select whichever size you’re called to from the drop down menu. This listing is for one (1) piece of tumbled blue kyanite and black tourmaline, which will come to you parceled in an organza bag. You will also receive a card to describe the properties of this stone, and a white sage leaf to clear energies – my signature touch. May this offering shield you as you find your sacred center. I just love my stone which I got wrapped so I can wear it all the time. Thank you! I love this stone! A beautiful piece with great protective energy! I like that is a two for one stone. I will keep this one on me all the time. Beautiful stone with a soft, warm protective energy.